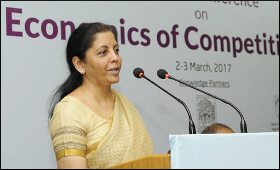 Minister of State for Commerce & Industry Nirmala Sitharaman Thursday said that the small and medium enterprises (SMEs) in India need a level playing field for their survival. Addressing the second edition of the National Conference on 'Economics of Competition Law' organised by Competition Commission of India (CCI) in New Delhi, the minister said that small business enterprises are really not getting the fair play. Speaking about the issues of small business, she said, "I think India, which has inherited a lot from small businesses, has a severe problem in terms of their survival." She said, "Entry and exit in business is very critical thing when we are talking about fair trade and fair practices. Most often companies (SMEs) find it possible to start, but difficult to exit." The minister said, "Exit is the biggest trouble for small businesses. If somebody lose out of business and wants to close business, there is a social taboo like situation that he/ she can't open up another business again." However she said that the Bankruptcy Code, which has formed recently, aims at making exit also easier. Remarking on the work and the achievements of CCI, she said, "I don't think Competition Commission of India is a work in progress. It has to continue to be more flexible, more dynamic, while factoring in the peculiar socio-economic needs of India." Speaking about the issue why India is not opening up its economy, the minister said, "To compare India with Singapore and China would lead us to frustration. Can we be a Singapore-like free economy straightaway...no." "We are changing at a pace which could have been faster but it's not at a same it can be a open economy. It is impossible given our social, economic conditions. Our growth, our development are not really evenly placed on across the country," she added.